So you know the outline font feature? 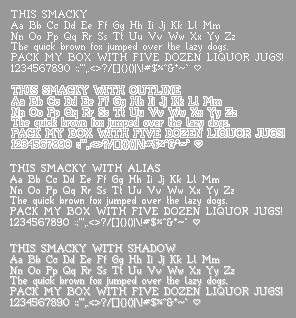 Well, I was wondering, since it doesn't technachly HAVE to be an outline font, what kind of weird, creative things could be done with the outline font feature? 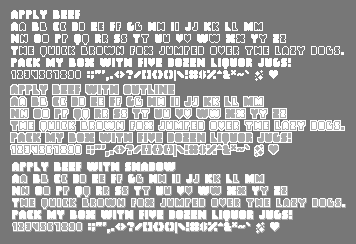 I made a handful of little pixel fonts that come with overlay fonts - Two of them come with a traditional outline font, and all of them come with another overlay font that can be used for anti-aliasing the base font. These were just made for fun, but I might make some more in the future. Feel free to use any of them however you wish! This is best viewed at size 13 - This font does not have a heart symbol. Instead, you may type an at symbol, a percent sign, an ampersand, or a broken bar (@ % & ¦ respectively) for various ink or blood splatters. 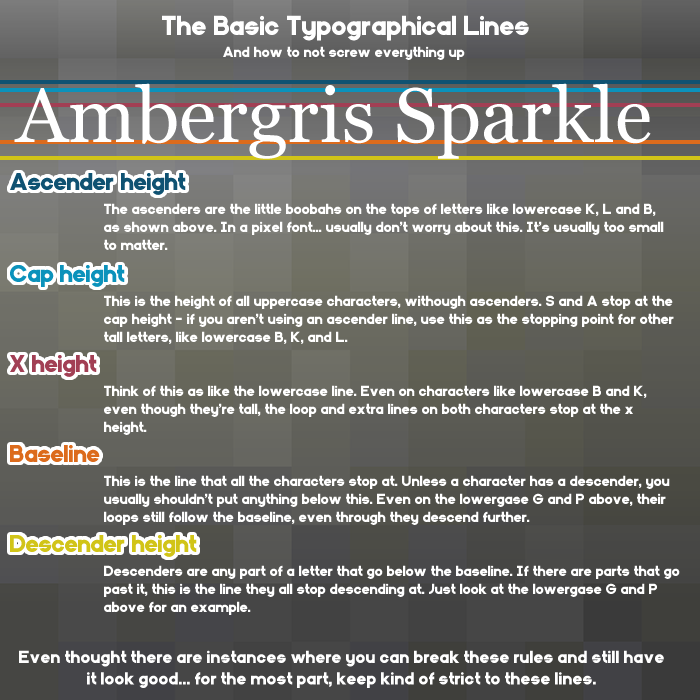 So basically, when you're designing a font, there are a bunch of guidelines you need to follow to make it look good. Sounds simple, I know, but I managed to forget this when I first tried this, and so I figured I'd put up some information. I tried to condense it, and here's what I came up with. Clearly, this is the cliffnotes version. If you want to go a bit more indepth, you can find plenty more information through this link. There are two main programs I use for my font design. The first I use is a simple browser program called Bitfont Maker 2. It's very simple to get started in - just click a spot to draw, click again to erase, and hold it down to draw/erase multiple spaces. Here's a little rundown of what everthing does. 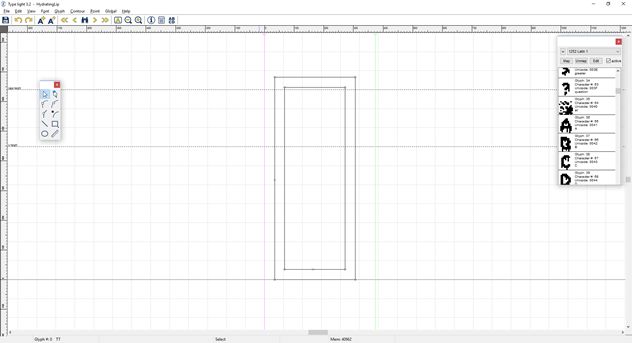 Since you can't draw the guidelines in this program, just make a note of the x, cap, and descender heights. 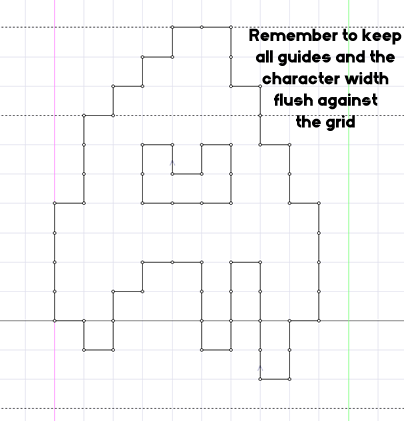 When you've finished drawing a character, it'll appear on the grid to the right. The space under the character grid is where you can see how your font will look, and let's you test it's legibility before you export it. You can click the arrows above the character map to change pages, but for an english AGS font, here are all the spaces you should fill in. 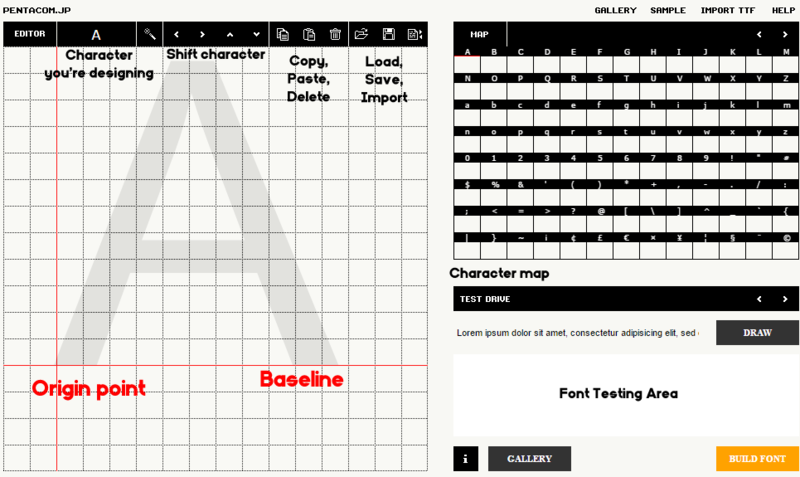 Once you have everything looking good, just click export to name your font, and set the spacing. 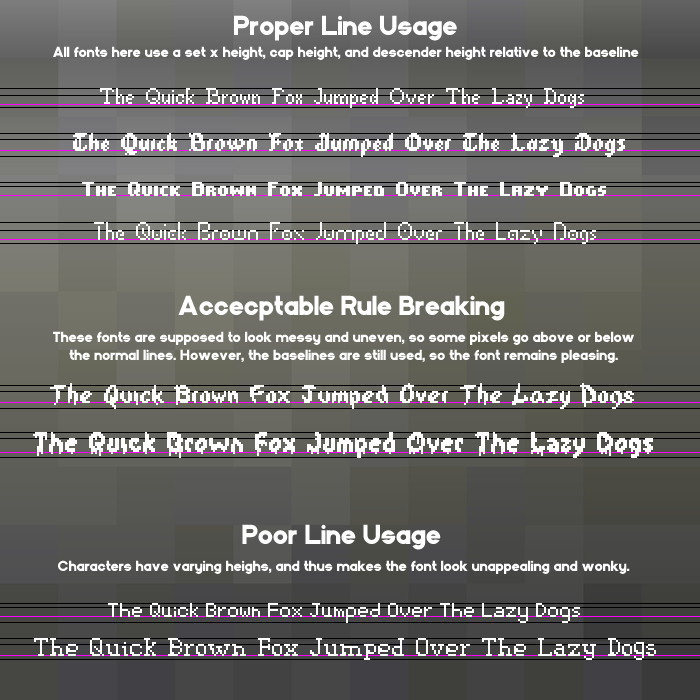 I usually use one pixel spacing by default, but it may vary depending on the font. Now here's the thing - What if the character spacing looks wonky? 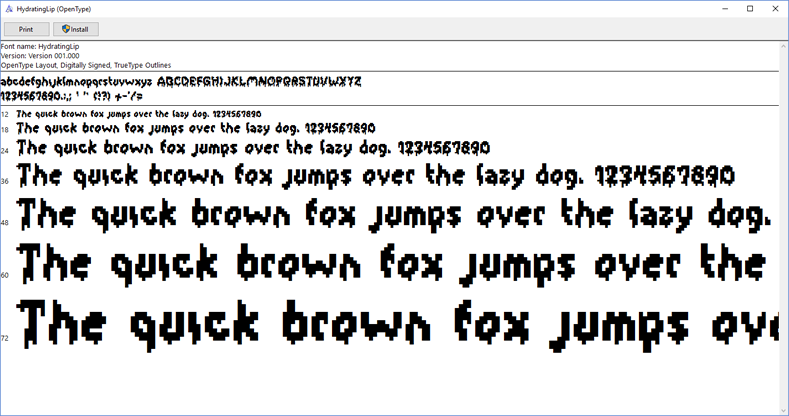 And this bitfont maker only exports fonts at 16 pixels - what if you need a smaller font? There's a free windows program named Type Light I use for all touching up. When you boot it up, it'll look something like this. 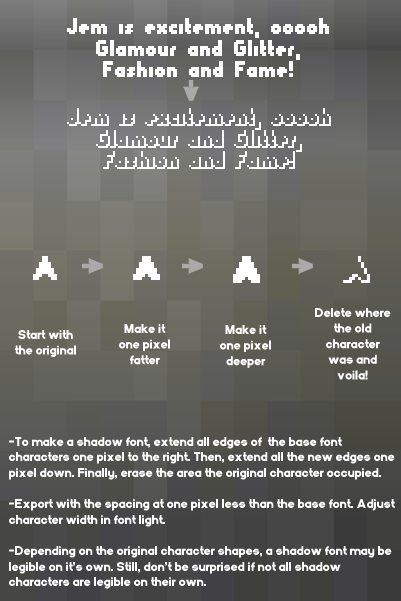 An important thing to note - if you're making a pixel font, go to "View > Grid > Snap to Grid" to make sure all edges align with the grid. A pixel font isn't clean or rounded, it's blunt and harsh. Scroll down the list of characters, and click on a character to touch up it's appearance and shift the character spacing, if you so desire. Once you're done doing touch ups, just save your font, and you're ready to install it! If there's anything you don't like about it after installing it, just edit the font file and reinstall until you're happy with it! 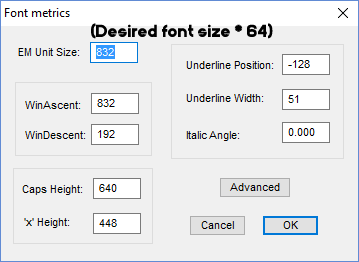 Design the overlay font in BitFontMaker as well. This will make everything so much easier, trust me. Keep BitFontMaker open in another tab, but have the base font in this one. This way, you can check your work before exporting the font. Make sure you don't save over it! Ooh, those are some nice fonts, and I love the interesting take on how to use the outline font feature in a unique way. There's definitely not enough fonts out there which do that. Nice work, Zoo977. I'm sure these will come in very handy. Contributions can usually go to the Contribution thread in the Critic's Lounge, so if someone takes issue, a mod can easily move your post there. 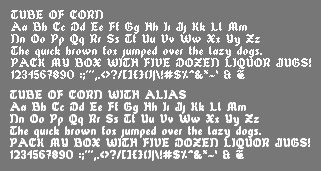 Either way, fonts are possibly the rarest contributions, so I'm sure these will be greatly appreciated! These are very nice. Thanks for serving an often overlooked part of AGS. Heeeeey, I'm glad all y'all are enjoying these! Uuh, I submitted a bunch more to Dafont, but they only upload fonts in a batch once a week, and they weren't uploaded last week. So, I'll have a few more up in a little bit. 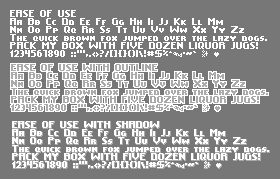 Remember, if you want a font for a specific purpose, feel free to ask, and I'll see what I could do! 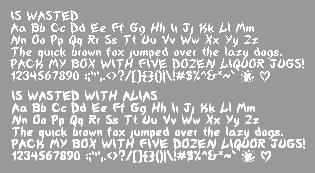 ALRIGHT, THE NEW FONTS JUST GOT UPLOADED! These could come in real handy. *edit: I've had a play around with the fonts (thanks for sharing! ), I may have ran into a snag. Correct me if i'm mistaken but wouldn't the anti-alias layer need to be semi-transparent for this effect to work fully? I've found that it looks great when the text is over a dark background, but when displayed over a light background the darker anti-alias pixels are more striking than the main font pixels. I have a hotspot indicator label tethered to my mouse cursor so maybe this neato trick isn't suitable for text outside of dialog boxes? I've had a play around with the fonts (thanks for sharing! ), I may have ran into a snag. Correct me if i'm mistaken but wouldn't the anti-alias layer need to be semi-transparent for this effect to work fully? I've found that it looks great when the text is over a dark background, but when displayed over a light background the darker anti-alias pixels are more striking than the main font pixels. I have a hotspot indicator label tethered to my mouse cursor so maybe this neato trick isn't suitable for text outside of dialog boxes? Ah, in some cases, the alias effect will slightly effect the shape of the character (although slightly), so semi transparency isn't the way to go. No, the alias effect is supposed to smooth out the font, so it should always be a color somewhere between the color of the text and the color of the background. By the sound of it, you have the alias darker than both the backdrop and the main font. If this isn't the case, please clarify. I hope this helps! In the meantime... I've got four more finished! Just got put up a little bit ago. I'll try and organize the fonts, as well as put together a mini=tutorial for the whole process in a little bit, so keep your eyes peeled! 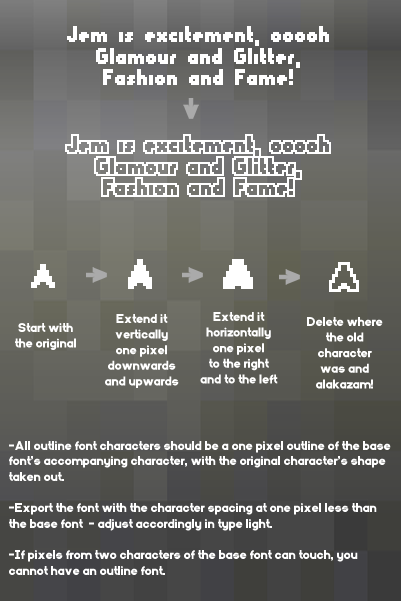 Not only for the tutorial, but all of the lovely fonts as well. 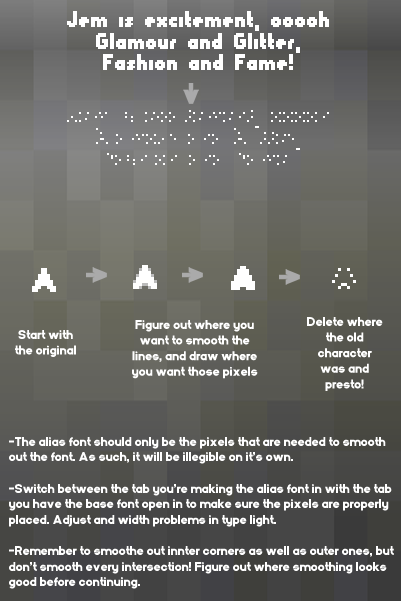 Hmm, I might use this tutorial to make a pixel font myself. Hey, I'm glad to see you're enjoying the tutorial! I'd love to see any fonts you guys make with it! In other news, I just ran out of font names with the naming scheme I was using, so I'm going to take a break from this. 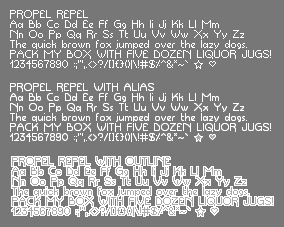 I'm going to try and make some more aesthetic fonts in the meantime. As well, my careful organization went over the character limit, so I had to get rid of all that. 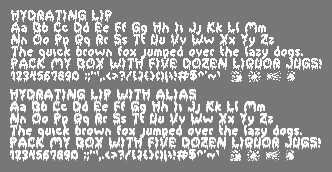 For now, here are the new fonts that just uploaded. Hope you enjoy! What license are these fonts released under? Oh... just wanted to say that I used 2 of your fonts (Chunky Dunk and Is Wasted) on my MAGS game "Out of Gas".